Showing results for tags 'Creations'. What are Your Favorite MOC Genres? 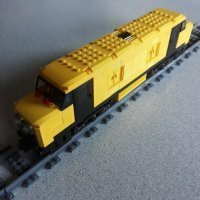 What are your favorite MOC genres to build within, admire others' work from, or aspire to hopefully build within in the near future if you'll ever have the opportunity? Whether they be based upon past or present preexisting themes, licenses, or product lines already covered by Lego (Star Wars, Classic Space, Ninjago, etc. ), or perhaps they've never been truly touched upon by Lego (Steampunk, Post-Apocalyptic, Licensed Franchises never yet partnered with TLG, etc. ), discuss your favorites here and share creations from those genres built by yourself or others. Hi I'm legologoart! I've been building with legos for forever, but just recently started sharing my designs on Instagram. I use Lego bricks to recreate logos such as Google, Pepsi, and Apple. I would love to have some fellow lego lovers to give some feedback and check it out at https://www.instagram.com/legologoart/ Have a great day!